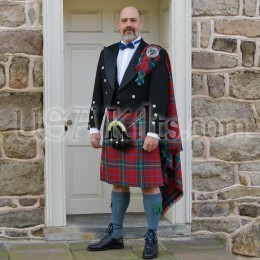 Need a kilt for your wedding? Or a Burns Supper? Or is it that you simply want to wear the very best highland dress? Our eight yard kilts are the pinnacle of traditional kilt design and construction. If you plan on only ever owning one traditional kilt in your lifetime, this is the one to invest in -- truly an heirloom quality garment. Our on-site kilt makers produce a kilt that is made to your exact measurements using only the best quality tartan from vetted and reliable mills in Scotland. Our reputation is built upon the beauty, comfort and durability of these premium kilts. In fact, we are known for over-building essential parts: Extra-strong embossed leather for the straps, Reinforced stitching on all stress points. Attention to every detail. And by making them here in the USA, we actually bring the cost to you down. Not all kilts are cut from the same cloth, to coin a phrase. 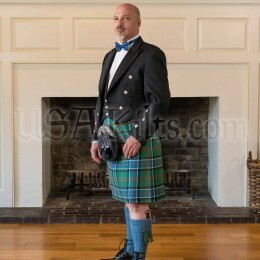 Irish or Scottish kilts for men who appreciate quality can be hard to find online. And we recognize that anyone shopping the web is taking a small leap of faith. That's why our Client Advisors are ready to answer your questions. Whether you are new to tartan kilts or have been wearing wool kilts (or even PV kilts or utility kilts) for some time, we know you may want more detailed information. Perhaps some advice on sizing and measuring. Or which tartan is best for highland games or sports...a formal event...outdoors....cool climates...hot climates...hiking...bagpipe parades. Don't worry, chances are we have heard your highland wear question before and have the data at our fingertips. A quality kilt should never be left in the closet on its hanger. We want you to enjoy yours as often as possible, so let us know how we can help you find the best authentic kilt for your lifestyle.